1. What all does your job entail, and do you enjoy it? I provide business, agronomy, financial and human resources support to our franchisees in the Southeast. With over 50 years of experience in the industry, Lawn Doctor offers custom lawn care solutions to residential and business consumers. I’ve been with them for 19 years. I love my job because it gives me the opportunity to help people scale and grow their business. I have the pleasure of working with some tremendous people who have chosen franchising as their path to small business ownership. 2. If you had one primary concern for the industry, what would it be? I would have to say regulatory and legislative issues both on the federal and local levels. Whether it’s passing a permanent H-2B returning-worker exemption at the federal level or issues like fertilizer/pesticide bans at the state or county level, we need to continue to advocate for our industry and small businesses. It’s important to get involved in the process locally in your own town. 3. Are you married, and what do you and your family do for fun? Yes, I’m married to my wonderful and supportive wife, Janice. We have four boys between the two of us: Devin, Michael, Brendon and Vinny — and our fur baby, Lily. We’re cat people. The boys are all older, so Janice and I enjoy spending time together traveling and saltwater fishing. We live a half-mile from the ocean. Living on the coast is awesome. When I’m not traveling, I keep a rod in the car, and I’ll just pull over once in a while and throw it out from the beach. 4. What was your favorite car? I’m a bit of a gearhead. My first car was a Dodge Challenger, but it only had a six-cylinder (engine). Then, when I was 18, I picked up this 1968 Ford Mustang. It was white with a dark red interior and powered by a 289 V8 and a manual transmission four-on-the-floor. I had a lot of fun with that car! I used to race a lot. I might have even lost my license for about six months while I had it … I had it for four or five years, and then it started getting rust, so I sold it. I wish I had it now. 5. What’s the coolest sporting event you’ve ever attended in person? Before I was in this industry, I worked in the automotive industry. Years ago, I had a good friend who was on a NASCAR Craftsman Truck race team. I attended several races along with the entire team in the garage behind pit road. I’ve been to football games, baseball games, but when you’re on that side with the cars coming into the pit — it’s a feeling you can’t describe. Seth Jones, a graduate of Kansas University’s William Allen White School of Journalism and Mass Communications, was voted best columnist of 2014 by the Turf & Ornamental Communicators Association. 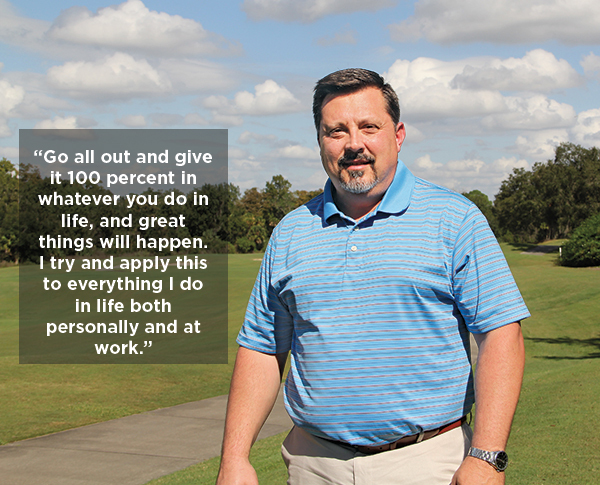 Seth has more than 18 years of experience in the golf and turf industries and has traveled the world seeking great stories. He is editor-in-chief of Landscape Management, Golfdom and Athletic Turf magazines. Jones can be reached at sjones@northcoastmedia.net.